This species is a smaller rounded tree than the live oak, which it is usually found next to. Its leaves are deeply lobed almost to the midrib vein and emerge in the spring, a fuzzy red turning into a rich light green. 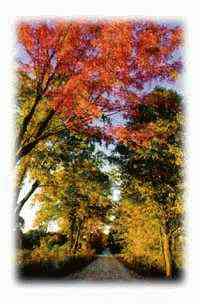 During the fall, the leaves gradually turn a brilliant red or maroon. This coloring is what make this tree the Queen of the Texas hill country. Highly susceptible to Oak wilt (a fungus disease) it needs to grown only where it can get optimum care and supplemental feeding to combat this disease. Still it is highly desirable as a smaller yard tree. This tree usually will grow to about thirty feet tall with a broad, rounded form of growth. Its leaves cast a light dappled shade over the yard and the slightest breezes can send the leaves twisting and flashing in the sun. Its acorns are about 1/2 of a inch wide and long, with darker brown stripes appearing when they are fully ripe. Relished by wildlife they would be a tree to plant to attract wildlife to your yard or ranch.